After an apparent sighting of a comet over the skies of Limerick, Ireland there was a report in the Limerick Observer on August 2, 1856 which quickly travelled around the world. It made appearances in The Hobarton Mercury in Tasmania as well as the New York Times and various Welsh newspapers. Where most places reported the marvel of the sighting, The Spectator in England was not convinced by the news stating “whether the comet has come or not, they seem to have a private conviction, in Ireland at least, that he has visited that favourited isle” . The article in the Limerick Observer tells of a “gentleman of the highest respectability” and the events that took place over a three day period that summer in Limerick. It began on Wednesday 30 July 1856, when the gentleman in question was standing by the Lax Weir in Corbally at about 10:30pm. His attention was suddenly drawn to what appeared to be a fire on the top of Keeper Hill to the east, in Tipperary. The supposed fire began to rise skywards and a friend who was with the gentleman thought that it may have been a lantern suspended from a kite. It was later described as “a globe of fire as large as a good sized orange with a broad tail of light extending about 18 inches.” The Monmouthshire Merlin reported: “the comet has been seen with a thundering tail standing out like that of a Kilkenny cat in a fearful passion, every hair at a right angle with the line of the caudal appendage“. Doubtless a colourful description, yet still another report described it as having a brilliant red body with pale blue tinges. The two men at the Lax Weir watched this miracle for about an hour, as did the two watchmen on the weir, before retiring for the night. The following night the man returned to the same spot, this time accompanied by his sister. They claimed to have seen the comet again, though it was higher in the sky this night than on the previous night. They stopped watching the comet at 11:30 on the second night. On the Friday night it rose once more at 10:40pm and was still visible until 1:30am. This report was released 300 years after the Great Comet of 1556 which known as the comet of Charles V who exclaimed on seeing the fireball in the sky “By this dread sign my fates do summon me“. 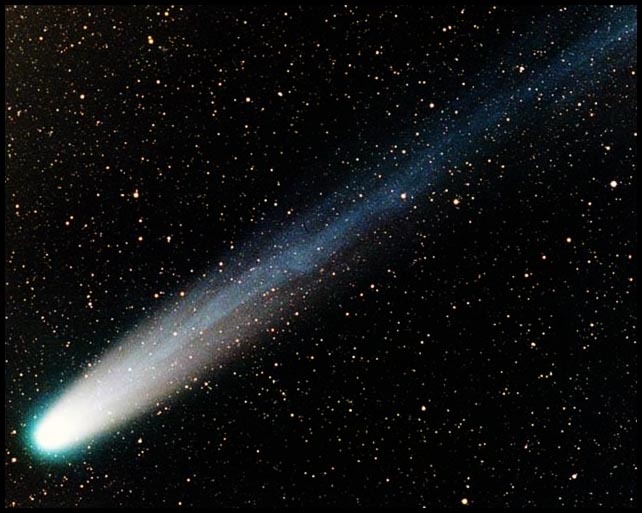 Two renowned English Astronomers, Richard Dunthorne and John Russell Hind, believed the comet of 1556 had a 300 year cycle though no note was taken of the Limerick sighting in scientific journals of the time.